I remember watching one of Dr. Oz’s shows some time ago. He was talking about people’s cravings. He talked about people that crave salty foods, people that crave sweet foods, and then people that crave salty and sweet foods. I fall in the last category. For as long as I can remember I have loved eating salty and sweet foods. 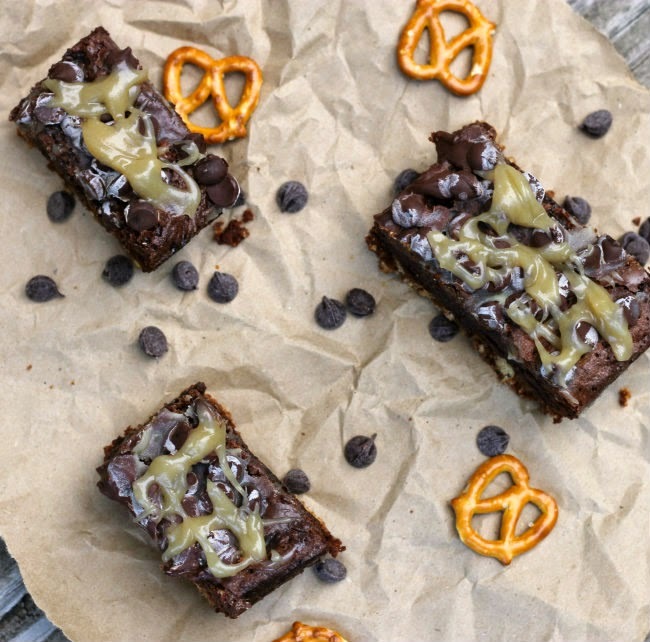 The combination of salty and sweet is wonderful… love the combination of chocolate and potato chips or in this case pretzels and chocolate. I was craving chocolate last weekend and something salty to go along with the chocolate. 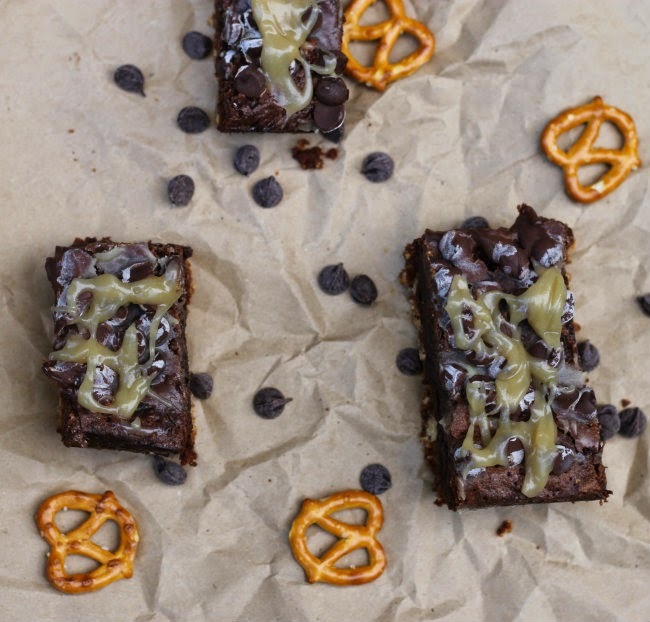 Well I knew that I had some pretzels in the pantry and brownies were calling my name. I love making flourless chocolate cakes so I decided to make the brownie part of this recipe flourless. It’s amazing how dense and fudgy these flourless brownies are. 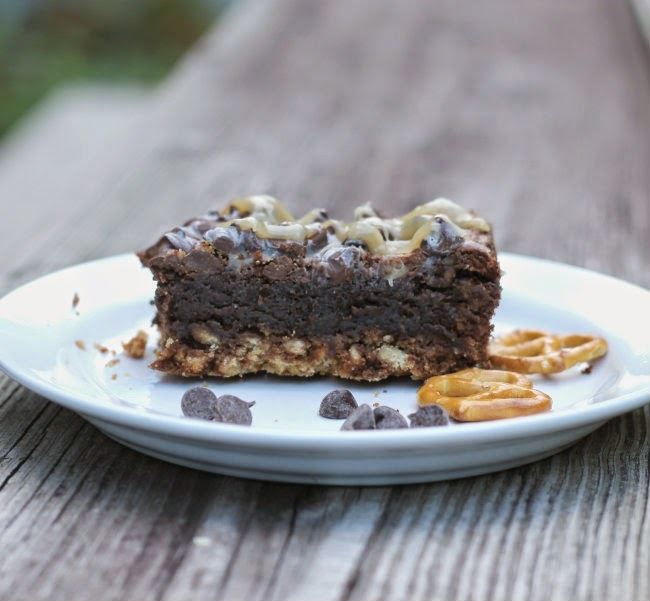 The pretzel crust gave a nice crunch and a bit of that salty flavor to go along with the chocolate. This certainly took care of my cravings. Oh, yeah I topped the whole thing with a bit of caramel sauce. 2. Combine the crushed pretzel with the 1/4 cup sugar and mix well. Add the 6 tablespoons of melted butter and mix until all combined. 3. Press into an 8 x 8 pan. Place in the preheat oven and bake for 6 minutes. Remove from oven and set on cooling rack. 4. While the crust is baking to a small sauce pan add a stick of butter (1/2 cup) along with the cup of chocolate chips, stirring occasionally. 5. In a small bowl add the 4 eggs, 3/4 cup sugar, vanilla, baking soda, and salt, whisk all together. 6. Add the egg mixture to the melted chocolate and butter. Mix together until well blended. 7. Pour over the pretzel crust and place back into the oven. Continue to bake for another 45 to 50 minutes or until the edges are firm and the center is set. 9. To make the caramel add the 2 12 tablespoons butter, 2 tablespoons brown sugar, 1 1/2 tablespoons corn syrup, 2 tablespoons cream to a small sauce and heat over medium heat to it starts to boil. Reduce the heat to medium low and cook for about another 10 minutes. es, the caramel with start to thicken. Remove from the heat and blend in the vanilla. 10. Once the brownies are cooled, drizzle the caramel sauce over the brownies. 11. You can serve with a bit of vanilla ice cream. Oh, yum! I just started working on brownies last week. Never ate many of them aside from my own vegan ones that by gosh, I misplaced the formula long ago. Someone just recently asked me if I had a recipe for a dessert with a pretzel crust and I had to admit that I’ve never tried it before. Guess I’m in the minority. Time to give it a try.